My clients love the variety of training using the stability ball. Not only are you getting the benefits of strength training, you are also strengthening your core and improving your balance. Give these exercises a try! Have FUN! Stand on one leg with the ball positioned in front of the body. Use the fingertips to slowly move the ball in a circle around the body, first clockwise and then counter clockwise. Switch legs and repeat. This move challenges the balance of the entire body, which begins in the feet. Using the ball to support the back, lean back against a wall so the body is at a 60- to 75-degree angle. Complete three calf raises: with toes pointed forward, with toes turned inward slightly, and with heels in and toes turned outward. Then turn around and complete the same calf raises with the belly on the ball. The multiple angles achieved by changing the position of the feet and then facing the wall, forces the ankle into mobility from a variety of directions. Facing the wall also allows for the muscles of the lower leg (gastrocnemius and perineals) to be stretched on the downward part of the movement. Lying face up on the floor, squeeze the stability ball between both ankles with legs extended at 90 degrees above the hips. Keep the knees in line over the hips and bend and extend the knees while squeezing the ankles together, maintaining the position of the stability ball between the feet. Using the quadriceps as well as the adductors, both of which attach around the knee and hip joints, will strengthen the knee and provide stability to this hinge joint without additional impact on the joint and its structures. Extend one leg out in front of the body and place the ball under that foot, elevating it off the ground. On the standing leg, sit down and back slightly until a stretch is felt in the hamstring of the leg on top of the ball. Next, while standing on the same leg, move the ball to the side of the body and rest the inside of the knee on top of the ball. Perform a small squat on the standing leg, allowing the ball to roll sideways from the body, until a stretch is felt in the adductors. Return to standing and turn so the ball is under the same leg, but the knee and ball are behind the body. Perform a small squat again, until a stretch is felt in the hip flexor of the leg that is on top of the ball. Repeat all three movements with the opposite leg on top of the ball. 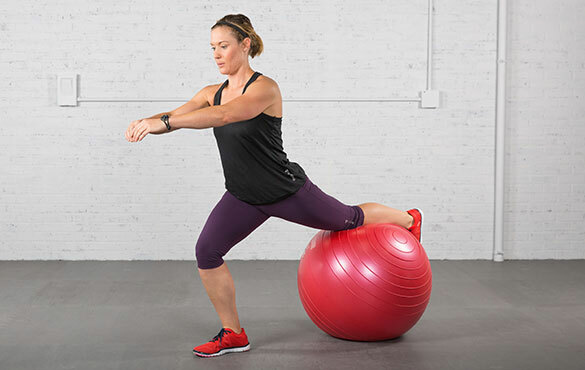 With the ball supporting the leg in all three directions of this movement, the muscles of the leg and hip are relaxed and mobility is enhanced. By moving through all three directions, the hip joints on both sides are forced to move through multiple planes, which creates mobility in the elevated leg and improved hip stability in the standing leg. Position the ball under the hips and begin with the toes and fingertips in contact with the floor. Maintain this position of the ball and slowly lift one foot and the opposite hand off the ground. Reach the hand and foot away from the center of the body, creating a straight line parallel to the floor before lowering back down. Switch sides. By engaging the posterior chain and lifting the arm and leg, the muscles of the trunk, particularly around the lumbar spine are engaged and are forced into creating a stable environment on top of an unstable surface. Sit on top of the ball with the knees are bent at 90 degrees. Place the hands behind the head and maintain an erect spine. Bring one knee up and rotate the upper body, moving the opposite elbow across toward the knee. It is important to not flex the spine forward; rather, rotate as far as possible and keep the chest tall. Return to the starting position and repeat on the other side. 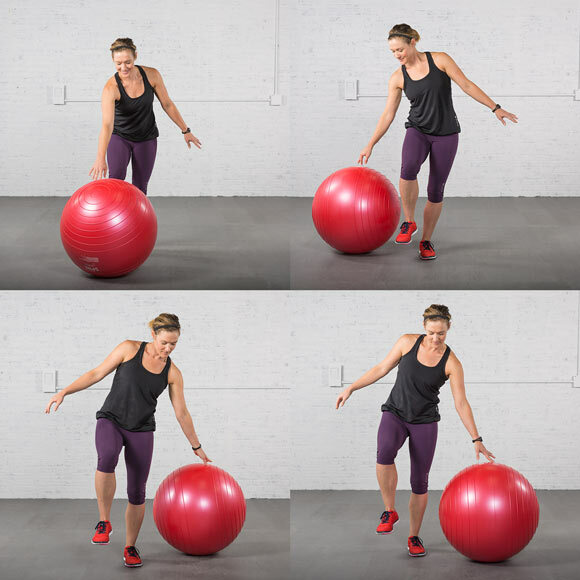 This move challenges the rectus abdominis and, by rotating the shoulders, mobility in the thoriacic spine is enhanced while the lumbar spine stays stationary to balance on the ball. With the stability ball under the hips, leave the toes on the ground and lift the upper body until a straight line is formed from head to feet. Engage the legs, glutes and back while pulling the shoulder blades downward. Begin with the arms extended below the chest, fingertips on the ground, palms facing inward. Lock the shoulder blades into place and raise the arms upward, forming each of the following letters: I, T, Y, W. The neck should stay long and the upper trapezius muscles relaxed. Performing these isolated movements with the shoulder blades “packed” helps to build stability in the scapulothoracic joint and increase overall trunk strength. Kneel behind the ball and, with arms outstretched, place both hands flat on top of the ball. While sitting the hips back toward the feet, stretch the arms forward, moving the ball away from the body. Return to a kneeling position and bring the palms off the ball, pointing the thumbs upward. Repeat the movement. Return again to kneeling and flip the palms again so the backs of the hands are flat on the ball. Repeat the movement. For the last rep, flip the hands yet again so the backs of the hands face each other and thumbs are down toward the ball. By changing the position of the hands each time, the hips sit back, all aspects of the rotator cuff are reached and mobility can increase over the entire joint rather than in a single plane of motion. Here’s a great dressing for salads, sauteed veggies, steamed fish or grilled chicken! 1) Combine vinegar, tamari, honey and ginger in a bowl. Whisk to blend. 2) Slowly add oil while whisking; mix well. 3) Store in refrigerator, tightly covered until ready to use. If dressing thickens when cold, hold at room temperature for 30 minutes and stir before serving. I am loving these recipes from the FixAte cookbook. Each one has been great! If you would like more recipes like these, leave me a message and I’ll give you the low-down on how you can get your very own FixAte Cookbook. Also check out my other recipes! When it comes to maintaining healthy habits, nothing can derail our efforts faster than a vaca or work trip!!!! Temptation lurks everywhere, <pastries, nachos, margs> and it is very challenging to keep to your healthy routine. Pack as many portable snacks as you can. Nuts, whole grain crackers and hummus, homemade protein bars <use your 21 Day Fix recipe book or FixAte cookbook for these>, individual sized oatmeal packets, diced fruit, cut veggies, apple and peanut butter and of course Shakeology packets. Just put in those handy zip lock bags and GO! And don’t forget your agua! Call ahead to see if your hotel has a refrigerator. Even if it doesn’t, you can usually request one to be brought to your room. Then you can plan to bring along healthy breakfast items, snacks and lunches so you can eat at least one healthy meal a day in your room. A quick run to the local store for these items will alleviate the stress of having to eat out every meal. 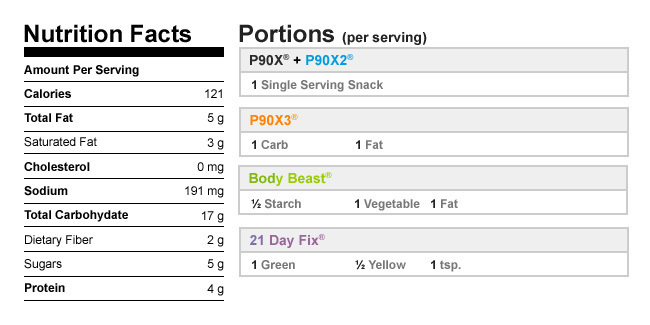 Remember—you don’t HAVE to eat out every meal! Take charge! Eat a light snack before going out for dinner. Putting a little food in your stomach, will help you be less tempted to over eat and will enable you to exercise more control. Go easy on the alcohol and other calorie-laden, empty beverages. I know. I know. Been there — done that. Look at the menu online and choose something healthy before you arrive. That way, you won’t be tempted by all the great smells and order something you’ll regret eating later. Know that you can order what you want, even if it’s not on the menu. If the ingredients are on the menu, there’s a good chance the cook will happily make something to your specification even if it’s not on the menu. I skipped the bun on a burger, order grilled meat with no seasonings or oils, skipped sauces and dressings all together or I asked to have them served on the side, opted for steamed, plain veggies instead of fries or a baked potato or I ordered a small side salad. Don’t be afraid to request what you want. It’s much easier now than it was for me as most menus include the nutrition info for each entree. Another thing you can do is order from the Kids’ menu—-yep, you read that right—-smaller portions peeps. Or ask for your meal to be split in half and that half boxed up before you get your food. Takes away that temptation of over eating. Or split it with a friend or spouse!! They can be loaded with fat and contain many calories. Order that glass of water and start drinking to curb your tummy until you food arrives. And Don’t Forget to Keep Moving! Take the stairs instead of the elevator even showing off by taking two at a time! You don’t have to be overwhelmed by eating when traveling. Just like at home…..PREP and PLAN AHEAD. Sure it takes time but it’s worth it. Don’t undo all your hard work! 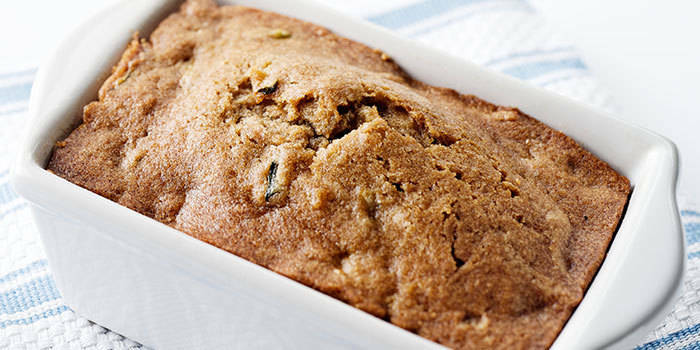 Try this healthier take on zucchini bread for your next brunch. 2. Lightly coat two 9 x 5-inch loaf pans with spray. 3. Combine egg whites, oil, applesauce, sugar, and extract in a large bowl. Set aside. 4. Combine all-purpose flour, whole wheat flour, baking powder, baking soda, salt, and cinnamon in a medium bowl; mix well. 5. Add flour mixture to egg mixture; mix until just blended. 6. Fold in zucchini and walnuts; mix until just blended. 7. Divide batter evenly between the two pans. 8. Bake for 45 to 50 minutes, or until golden brown and tester inserted into the center comes out clean. 9. Cool bread in pans for 5 to 10 minutes, remove from pans and transfer to rack; cool completely. Tip: Leftover slices can be wrapped individually and stored in the freezer for future meals.